Wednesday, April 27, 1859.Urbana, IL. 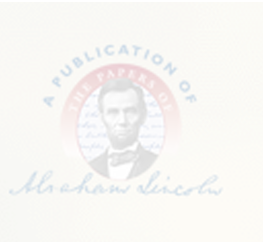 Lincoln calls on editor of "Central Illinois Gazette" in West Urbana (Champaign), who notes visit: "We had the pleasure of introducing to the hospitalities of our sanctum a few days since the Hon. Abraham Lincoln. Few men can make an hour pass away more agreeably." Central Illinois Gazette, in Illinois State Journal, 12 May 1859; J. W. Scroggs to Herndon, 3 October 1866, William H. Herndon Papers, Henry E. Huntington Library, San Marino, CA. In court Lincoln writes praecipe and answer of guardian ad litem in Mary Ann Hillman v. heirs of Oliver Hillman, petition for partition. Photocopy.